Ed Lu, Valery Tokarev and Greg Olsen- Live from Croatia! Not since Yuri Gagarins visit 46 years ago has a space explorer come to this part of the world. Now Ed Lu, recently retired US Astronaut; Valery Tokarev, an active Cosmonaut who has flown on the Shuttle and Soyuz; and Greg Olsen, the third private space explorer to visit the International Space Station (ISS) are joining some of the newer suborbital space hopefuls for a panel discussion each evening on human space exploration. The event will be webcast live at www.space-forum.org at 5:30 pm local time, which is 11:30 am Eastern/8:30 am Pacific, today, Saturday and Sunday. 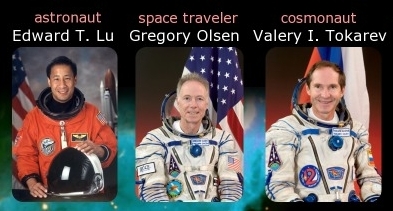 After the Shuttle Columbia disaster, Lu was asked to launch on a Soyuz as the Flight Engineer (the first time an American had filled that role), since they needed to launch with a crew of two- not three. He had to learn a year and a half worth of material in nine weeks. After talking to him at dinner last night- I have no doubt he could pick up whatever he wanted in nine weeks. He ended up spending six months in space on that mission. Tokarev was originally to be the pilot for the Buran, a Russian vehicle that looks very similar to the Space Shuttle. However the Buran only flew an un-piloted test flight before being moth-balled in the 90s. Luckily Tokarev got a second chance and has flown and spacewalked with the Russians and the Americans. It was his Soyuz launch that brought Greg Olsen for his 10 day stay on ISS. Olsen first got the idea to go into space reading about Dennis Tito and Mark Shuttleworths flights in a newspaper in Princeton, New Jersey. Olsen is an engineer and businessman and even worked to bring a few experiments of his own to space before getting derailed by US regulations and other logistical issues. Olsen was the third of five people to have paid to visit the space station. He was followed by space blogging sweetheart Anousheh Ansari and Microsoft millionaire Charles Simonyi. They are all here thanks to the passionate efforts of a band of young Croatia astronomers and astrophysicists committed to creating a renaissance of science and technology in their country- a country whose constitution is only 17 years old. They see the future as up to them to build and they are not afraid to take it on. Tune in and get inspired about what you can make happen in the future- no matter how old your countrys constitution is. 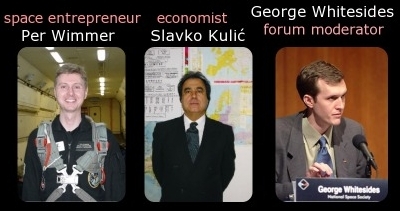 Split - June 1, 2007: Astrophysics Initiative in Dalmatia is organizing a prestigious international forum "Human Presence in Space" with astronauts, cosmonauts, space travelers and space entrepreneurs as forum panelists. This event is a part of Dalmatian Space Summer 2007 and it will take place in Split on August 24-26, 2007. Through a series of public lectures, participants of the Forum will talk about their experiences in space flight and present some of the basic problems in human conquering of Space. Lectures will be followed by public round table discussions with the opportunity for general public to ask questions to the forum participants. The Astrophysics Initiative in Dalmatia (ApID) is a collaboration of scientists and educators who share the common goal of advancing astronomy and astrophysics in the region of Dalmatia. The core ApID activities include the astrophysics graduate program at the University of Split, research projects that complement and enhance the graduate program, and logistical support to educational and outreach projects. The graduate program is approved by the Croatian Ministry of Science and Education, and hosted by the Department of Physics at the University of Split. It is scheduled to begin in the fall of 2008 and will conform to the highest quality standards in science and education. Designed from the beginning to follow the best international practices, this program will help minimize the loss of highly skilled and educated people from Croatia and enable a brain gain of both Croatian and foreign scientists. ApID will further enhance these achievements by bringing international research projects and collaborations to Croatia. Two highly interdisciplinary research directions in modern astrophysics will be pursued: "From dust to life" with topics concerning extrasolar planets and astrobiology, and "Large-scale computations and data mining" with topics bridging astrophysics and computer science. The experience gained through ApID programs will be applicable to other disciplines, and in the wider region of South Eastern Europe. Its success will set an example of how to initiate, organize and manage similar projects at other institutions in Croatia and in transitional countries in general. The education and research programs will be combined with strong outreach activities to increase the ApID's public visibility and enhance fundraising opportunities. Several outreach projects are already underway in collaboration with the non-government non-profit organization Society znanost.org. In the next five years, ApID will help create conditions for establishing two senior astrophysics faculty positions, at least four postdoctoral positions, and several visiting scientist positions at the Department of Physics of the University of Split. The hiring plan also includes support staff for fund-raising, public relations, and outreach activities. The projected annual operation costs for ApID are 500,000 Euros, with one third of the budget already secured through the University of Split. ApID is envisioned as a center of excellence in modern aspects of tertiary teaching, research in astronomy and astrophysics, implementation of information technology, advancement of multidisciplinary studies, and the production of a technically trained work force. ApID will develop a strong, internationally competitive teaching program. Its exciting and innovative higher education program will be combined with world-class research and outreach programs. This will enable ApID to produce outstanding scientists and entrepreneurs who will have the skills and knowledge needed to excel in the global market economy. They will also be leaders capable of adopting and disseminating new knowledge for the benefit of their local communities.